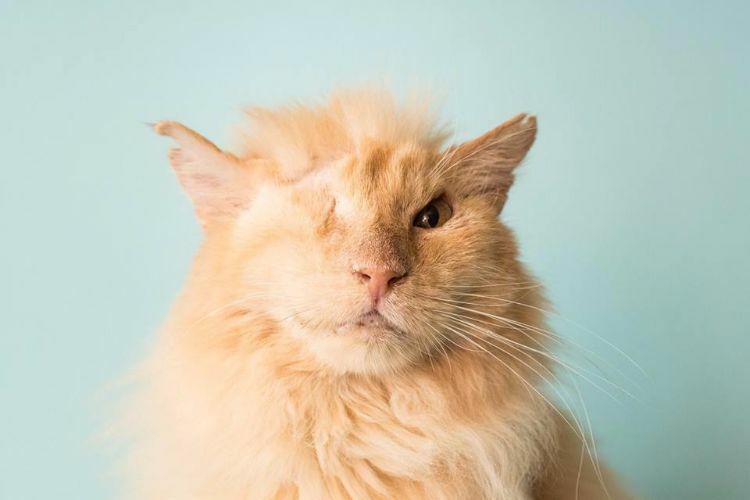 Gentle orange tiger tom Sir Thomas Trueheart started out life with the bad luck of being a lost stray in the California desert and then even that took a turn for the worse. He appeared one day on someone's doorstep, badly injured. Days before, someone else, less kind, had dumped acid on his face. 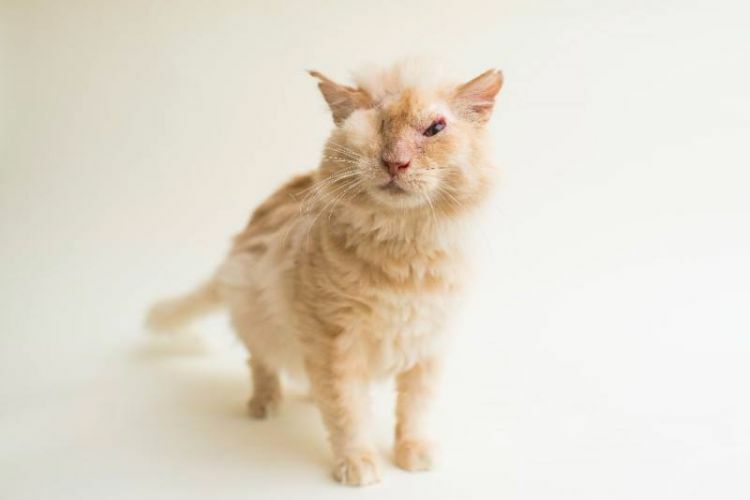 It destroyed his right eye and badly scarred half of his face. The culprit was never identified. 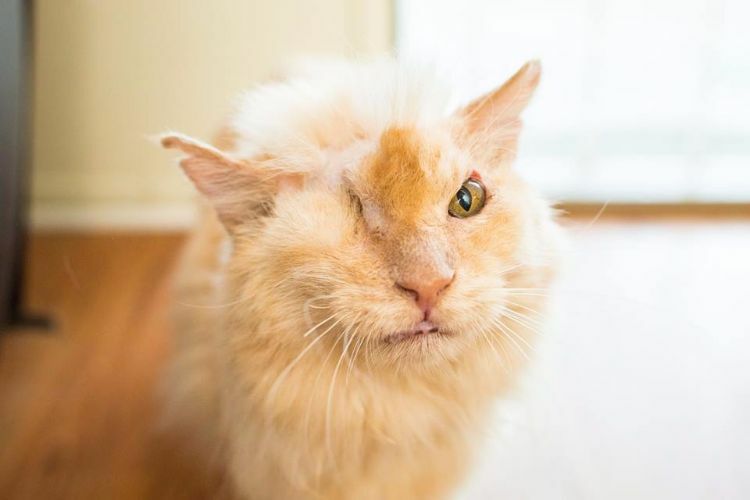 To make matters worse, when Tommy was brought to a vet, it turned out he was FIV+. All strikes seemed to be against him. The vet gave the woman who brought him in some antibiotics and advised putting him down, but she refused. Instead, she reached out to Milo's Sanctuary in Burbank, CA, a pet rescue that takes in pets with special needs. 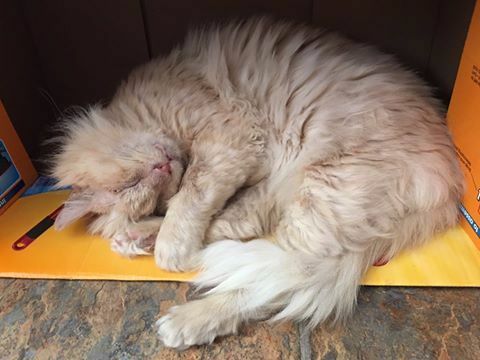 Milo's Sanctuary had the woman take him to another vet, where he was treated with antibiotics, painkillers and special bandages. He also received a skin graft. Fortunately for Tommy, the friendliness that had got him in trouble now helped save his life. He remained sweet and loving and even grateful throughout his long recovery. He has since arrived at a long-term foster home and has become quite a celebrity. He's even won the Biggest Newcomer at the CatCon awards and has turned into quite a stately and fluffy kitty. See the video below of Tommy proudly accepting his nomination. 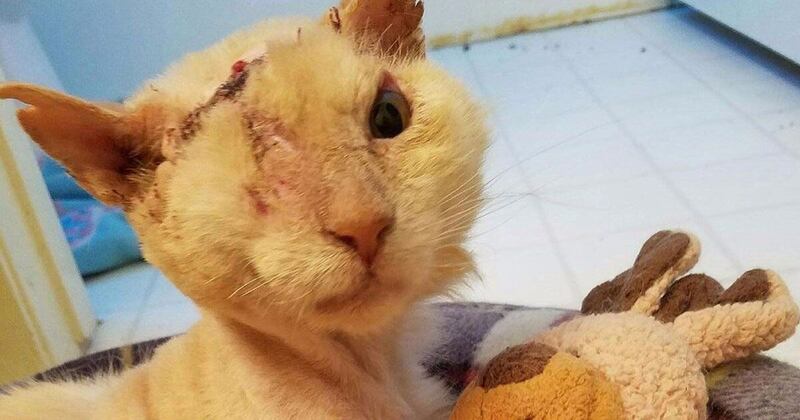 He now helps the rescue raise money to help other injured cats in need. Sir Thomas Trueheart is a true ginger knight.